All the commands on the menu can be invoked with keystrokes as well as by clicking on the menu. 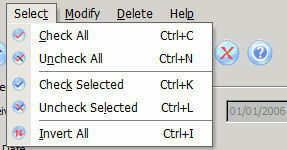 Each key combination is effected by holding down the Control key while clicking on the letter shown on the menu. Remember: The menubar buttons will not perform global modifications but will only modify the messages displayed in the Message List.